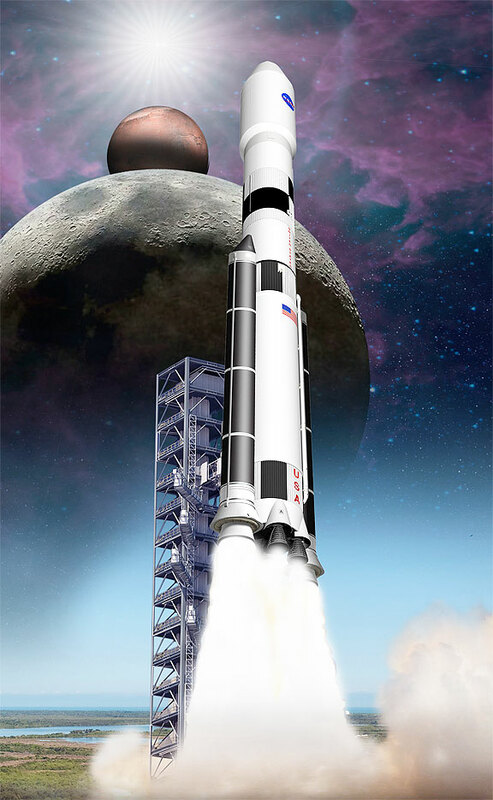 Artist concept of ATK's Advance Concept Booster in support of NASA engineering and risk reduction tests as part of their Space Launch System (SLS) program. Photo courtesy of ATK. ...complete engineering development and risk reduction tests as part of the Advanced Concept Booster Development for the Space Launch System (SLS). ATK's effort focuses on overcoming key technological challenges in developing advanced booster requirements for NASA's SLS program. Tasks within the scope of ATK's award include development of a lithium-ion battery-powered electric thrust vector control system; high-performance propellant; lightweight composite rocket motor case; and an advanced nozzle. All of these developments will culminate with an integrated booster static test firing of these technologies. All of these tasks use cost-saving processes and materials that reduce cost and help lower risk as NASA moves towards a higher-performing booster in the future. ATK's advanced booster concept leverages the company's human-rated experience on the Space Shuttle and five-segment first stage programs in conjunction with its extensive commercial heritage in supporting Delta, Antares, Pegasus and Taurus programs.